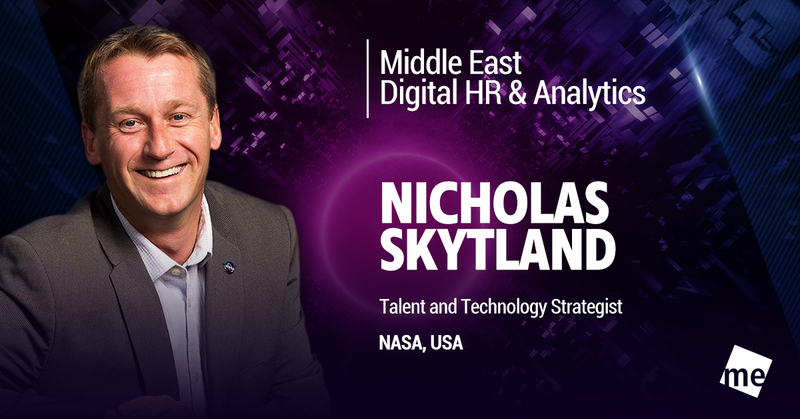 Join Nicholas Skytland, Talent and Technology Strategist NASA, USA, in the Middle East Digital HR & Analytics event to gain more insights on the modern role of an HR Professional in the Age of Disruption. For the last 60 years, NASA has successfully attracted innately curious and relentless adventurers to explore the unknown for the benefit of humanity. This workforce has achieved the impossible, from the unforgettable feats of the space race and Mars rovers to lesser-known inventions like a reimagined hearing aid enabling people deaf at birth to hear for the very first time. We have recently interviewed Nicholas Skytland, Talent and Technology Strategist, NASA, United States, where he shares his thoughts on driving NASA to be digital, including the challenges faced, and future plans in the years to come. Management Events: As the digital shift is happening rapidly, HR Leaders are now being pushed to drive their organizations to be digital, and not just to do digital. How do you spearhead this change in NASA? What are the challenges you encountered along the way? NASA: To navigate the next 60 years well, our biggest challenge is the ability to navigate a fast-paced, ever-changing technology environment. To spearhead the change in NASA, we recently completed a Future of Work study that focuses on how we continue to navigate this change. The study gives our HR leaders a structured way of thinking and organizing insights, while simultaneously calling attention to the most significant themes for NASA in the future. The report reveals eight major themes that highlight insights, challenges and tangible opportunities for NASA. To attract top human talent, organizations must embrace the new dynamic human talent pool that enters the organization through all manner of new work arrangements, (e.g., traditional employment contracts to citizen scientists); and at the same time strategic workforce planning, acquisition, and management practices must enable a workforce that is resilient to shifting mission priorities. Redefined talent runs along a continuum ranging from the traditional full-time employee to part-time workers and supplemented by machine talent (e.g., artificial intelligence and robotics). Work can now be conducted anywhere and anytime through making information, data, and tools available to an increasingly mobile workforce. Workplaces must also adapt as the work and workforce evolve. Modern workspaces are being redesigned for flexibility, autonomy, and collaboration and to enable an increasingly remote, agile workforce. The ability of organizations to leverage data to drive insights to action is critical. Yet data access is often prohibited due to the underlying tension between sharing and security. An enterprise data management strategy and modern, common data architecture are critical to securely share information and data. Advances in technology will allow organizations to better organize and distribute work tasks to qualified individuals, replacing or outsourcing others and generally augmenting the existing workforce. As machines start to think and act humanly, organizations will be able to more efficiently assess real-time data, assign responses, allocate tasks based on assessment, streamline knowledge-driven processes, and enable more objective decision-making. ME: What are the skills required for them to overcome digital disruption? What is your advice for HR professionals to thrive in this digital era? NASA: NASA recognizes that today’s environment is significantly different from that of its past decades of success. This requires a new skill set to build resilience to overcome digital disruption. Although the future is marked by constant waves of change which is being largely driven by the rising rate of technological change, the skills required to overcome digital disruption are not necessarily technical. To succeed in this environment, HR professionals must be able to work well in a multidisciplinary environment, adapt to change quickly, and facilitate rapid learning in others. Practically, HR professionals are now being asked to navigate a world where work is less geographically-based, organizational structures are flatter, responsibilities are matrixed, and work structures are more complex. NASA is working to equip its own workforce with the skills it needs through a myriad of different tactics including creating employment opportunities around talent rather than seniority-based positions, providing resources for lifelong learning, cultivating an environment of decreased risk aversion, and avidly working towards the understanding and the adaption of generational differences. Additionally, HR professionals are now being asked to navigate a world where work is less geographically-based, organizational structures are flatter, responsibilities are matrixed, and work structures are more complex. To succeed in this environment, HR professionals need to focus on people, technology, and data in everything we do. We often focus on just the people part of the equation in HR. However, in the Future of Work, HR professionals should recognize the power of data and technology to scale all that they do. ME: What are the vital qualities of an HR professional in the digital era? Business Acumen: Understands and uses insight into how NASA’s human, fiscal, financial, procurement, and acquisition functions are used by and impact the client to improve talent and business outcomes. Consulting: Engaging with organizational leaders as a pair of hands, a Human Capital expert, and a process consultant to assess, design and intervene in impactful ways that enable key strategic objectives. Talent Management Acumen: A knowledge of the broad field of Human Capital disciplines including guiding principles and policies, best practices, emerging concepts, NASA HR programs and operations, and the like in order to generate and integrate talent and business outcomes. Strategic Thinking and Action: A mental or thinking process applied in the context of achieving success in an endeavor, resulting in the ability to devise effective plans in line with an organization’s objectives, often within a particular environmental situation. Strategic thinking helps business partners review policy issues, perform long term planning, set goals and determine priorities, and identify potential risks and opportunities. Digital Readiness, Critical Thinking, and Problem Solving: The ability to think analytically, as well as proficiently use modern tools, technology and data to define and address workforce and organizational challenges. Organizational Development: A field of expertise where a systems approach is applied to expand the knowledge and ability of organization and individuals to accomplish and enable more successful change and performance. Working with their clients to assess current and future states, identify root causes, future requirements, and changes needed, interventions are executed, and subsequent evaluation is facilitated to ensure the system is operating effectively and goals have been met. ME: What has been the biggest challenge you have encountered in the Talent and Strategy Division at NASA? What did you do to overcome this? NASA: NASA is an enormous organization with more than 18,000 civil servant employees and many more contractors so navigating the Future of Work can be difficult. Two big challenges we have is our external environment and internal culture. Internally, NASA is known as a world-class institution routinely defining the cutting edge of science, aeronautics, and space exploration, and has a history of employing the very best talent, long recognized as the Best Place to Work in the United States Federal Government; a title it has held for the last 7 years. However, defining the culture at NASA is much harder. In fact, NASA has multiple micro-cultures that are the result of a decentralized workforce that is dispersed across many NASA Space and Research Centers. This allows NASA to remain flexible and distribute its work effectively but can lead to counterproductive habits, actions, and mental frameworks. ME: What are the biggest differences/changes in comparing the pre-digital era, to today’s age of disrupting technologies? NASA: From our perspective, there are four recurring patterns and themes that come up over and over again. These four largely uncontrollable external factors influence our organization and all of them existed prior to our current digital era. These factors, or meta forces, include mission, people, technology, and place. They act as lenses to view the future of work at NASA. The only force that has changed in today’s disruptive era is that of technology, and it has just become more pronounced. Below is a summary of the four major forces. Mission: Space as an industry is emerging with increasing and new competition. The influence of existing laws, complex regulations, policies, and processes impact NASA’s ability to implement its mission. NASA’s mission is to drive advances in science, technology, aeronautics, and space exploration to enhance knowledge, education, innovation, economic vitality and stewardship of Earth. Our mission statement outlines our fundamental purpose as we partner with private companies and international entities to reveal the unknown for the benefit of humankind. Technology: The most widely discussed driver of change for the future of work is technology. The evolution of technology is fast-paced and alters the way we communicate information and coordinate in real time. Technology enables NASA to more effectively translate data into knowledge and improves the Agency’s ability to make real-time strategic decisions and increase operational efficiencies. Place: Where we work, when we work and how we work is constantly changing. As we continue to migrate towards a global and connected workforce, we anticipate new opportunities to improve employee engagement and satisfaction through the use of our physical and virtual spaces. NASA is an early adopter of telework across the government and continues to explore new work arrangements. NASA also recognizes that great ideas can come from anywhere, including outside of the traditional organizational boundaries, such as through ideas submitted by citizen scientists. ME: What are your future plans for NASA’s Office of Human Capital Management? How do you see your organization in the next 5 years? NASA: NASA is embracing this change and accepting the challenge to innovate in order to retain, attract, and engage the next generation of talent. To lead this shift and re-conceptualize the Future of Work, NASA has started to envision what the future can look like and has begun to take steps to transform. NASA is intentionally developing a multidisciplinary talent pipeline, redefining what it means to have a career, and modernizing its approach to meet the needs of the future. In five years, the Agency will be much better positioned to fully leverage the benefits of a diverse, interdisciplinary and agile workforce. The new office of Talent Strategy and Engagement is investing in forward-leaning talent strategy, programs and initiatives, in order to recruit and mobilize top talent and produce a culture that embraces bold change. Our organization includes people analytics, strategy and innovation, and workforce planning, and our work focuses on positioning NASA to remain a competitive leader in the industry.